This one could take a while to read so get comfy. I’ve been looking into going cruelty free for a while now and I’m proud to say that as far as I know I haven’t purchased any product recently that was tested on animals. So what is cruelty free and what to look out for? Products and brands that are cruelty free do not test on animals, although at some point in human history, they cannot guarantee a specific ingredient was not tested. Some brands are vegan, meaning they do not contain any animal products at all eg. Beeswax, whilst others unfortunately do test on animals. Even more confusing are brands that are cruelty free but who are owned by a company who are not, so it is up to you how you feel ethically about supporting these companies. For example it is unclear whether L’Oréal test on animals as they sell their products in China, which requires by law animal testing. Good things to look out for are products branded suitable for Vegans or Vegetarians with V, cruelty free and the leaping bunny logo, which signifies they have registered as a cruelty free organisation. 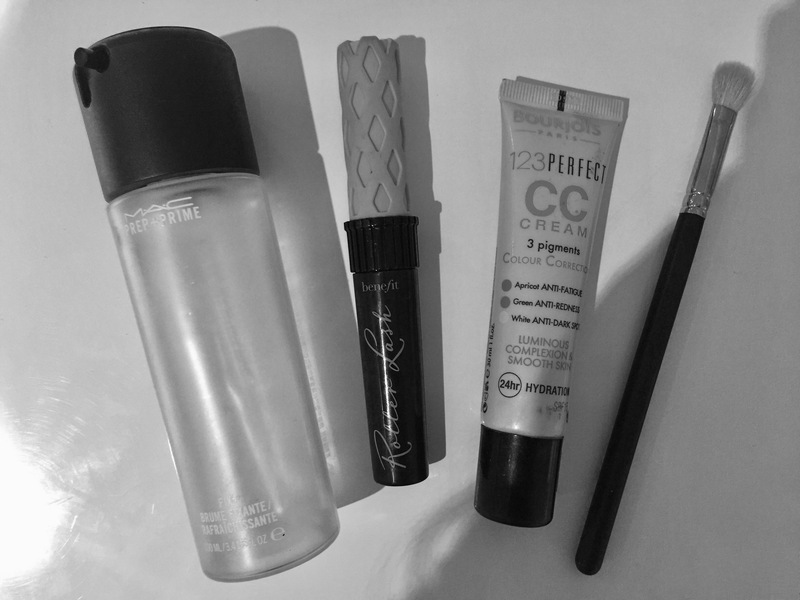 So what’s in my everyday makeup bag? Lets talk brushes, I’m proud to say that all of my brushes, bar 1, are cruelty free. I use a variety of Real Techniques brushes, which contain synthetic bristles- meaning no animal hair. 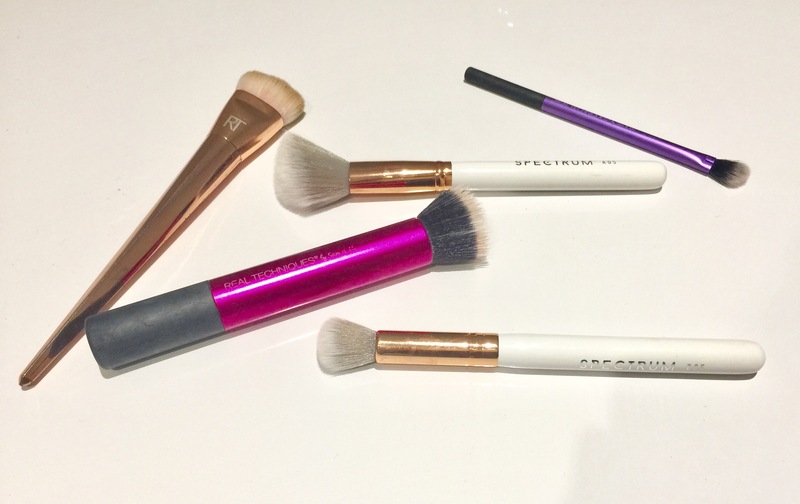 My favourites include the Expert Face brush and the Stippling Brush which I use for applying Cream products such as blush. The other set that I ADORE is my new beautiful Spectrum White Marbleous 12 piece kit (£64.99)- not only are these brushes easy on the eye, they are also Vegan! 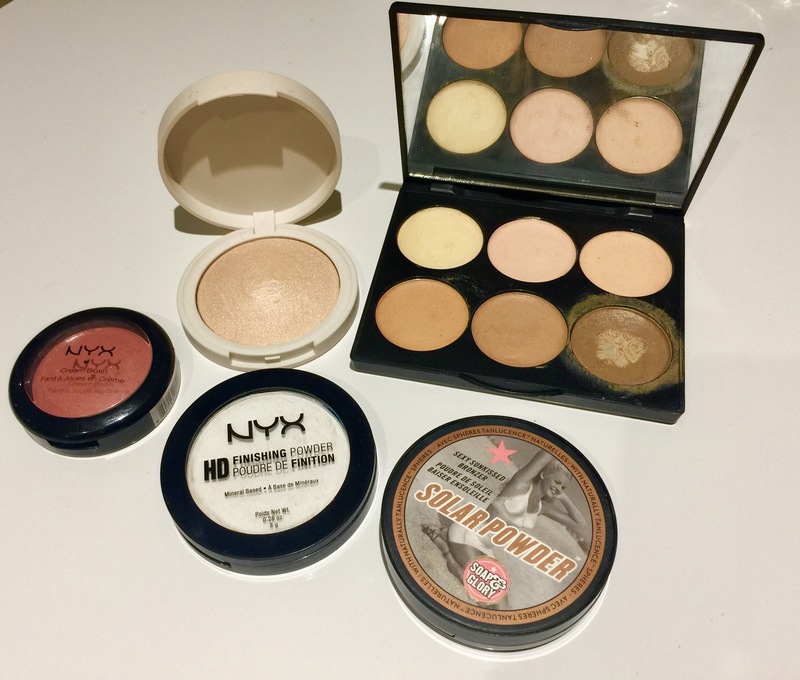 Next Base and Finish, on one hand I feel I have done well in finding all my primer, foundation, powder and blush needs at the NYX counter- stated on the products as Cruelty Free, but it must be considered that their Parent company L’Oréal are not. Although this does bother me, for now it gives me piece of mind that the products themselves were not tested on our furry friends. My everyday stash also contains the Sleek Cream Contour Kit (£10.99), the Collection Lasting Perfection Concealer (£4.19) and the Topshop Crescent Moon Highlighter (£12)- each brand states in its FAQ that they do not perform tests on animals, so far so good. Another fave is Soap & Glory Solar Powder- Amazing for fair skin. PS. Ignore my filthy contour kit- it is loved. Eyes, I am a eyeshadow fanatic but I’ve managed to narrow it down to just 2 palettes for my makeup bag, at the moment I’m loving the Zoeva Cocoa Blends palette ( See my January Favourites for more rambling) and the newest edition, my Naked Ultimate Basics palette (£39.50). Again here we have a situation of a non- cruelty free parent brand. When will all the companies just stop testing? (please I beg). Brows we’re back to Sleek with their Brow Kit (£8.50) in the shade light- a simple powder and wax combo that works for me. This bag sounds too good to be true and here’s where it goes wrong for me- Mascara. I am fully aware that my mascaras need to go- they are not cruelty free and it bothers me every time I apply them but I cannot find a good dupe that is CF. I use Benefit Roller Lash and Clinique High Impact Mascara- I’ve decided to use them up but once they are done I will not be repurchasing, so if anyone has a recommendation I’m all ears as I’ve been scouting so many blogs recently for ideas. My other fail is my setting spray- My first choice is NYX dewy setting spray– its perfect…but its run out and at the moment I am left guiltily clutching my very old bottle of Mac Fix+. Again once its gone its gone, I will admit over my younger and less educated years I was a Mac kinda gal, but those days are gone and I cannot remember the last time I purchased one of their products- in fact I have even given away almost all of my old stash. MUST BIN- Another naughty item is my Mac 217 brush- fab for blending but dreadful for my conscience. My other go to base is Bourjois CC cream but i’m fairly certain they are not cruelty free so my faithful friend may have to go. Some websites that have really helped me root out the good the bad and the ugly are Logical Harmony and the PETA website, both include extensive lists of Cruelty Free Brands. But don’t panic not every brand (especially smaller UK ones) are not listed, so if in doubt have a google and try and find a statement direct from the company. One of my best tips are to try Superdrug they have recently begun stocking a number of brands that are animal friendly- and all of their own brand products are too. Hopefully this post has been helpful and if anyone has any advise or words of wisdom I’d love to hear!